Want to Know How to Grow Parsley? Why should you need to know how to grow parsley? Well... as it's the world’s most popular herb, growing it yourself is a great way to add fresh herbs to any garden. Not only is it attractive, and fairly easy to grow, but with its multitude of uses, its rich vitamins and many health benefits, this herb is a must for any kitchen and herb garden. 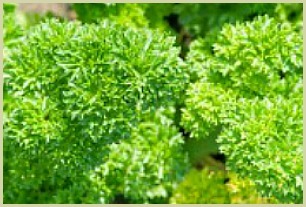 The most common varieties are either the flat leaved or curly leaf parsley. Read more about curly leaf. And depending on the climate where you live, for two harvests, the best times to sow the seeds are once in the spring (indoors) and again in the summer (indoors or out). As it requires warm temperatures for germination, it’s usually a good idea to start the seeds inside in a warm place. The germination period can take 2-3 weeks if you use a propagator set at 18-20°C (65-68°F) or 4-6 weeks if you don't. In general, the parsley plant likes a sheltered spot, well-draining soil and plenty of light. Just pick the fresh leaves when you need them. When you’re harvesting, cut the outermost stalks just above the ground to encourage further growth. Having a few plants will ensure you do not overpick. If you've grown Hamburg parsley, dig up the roots in late autumn. At the end of the season, it is possible to dig up your plants and bring them inside and harvest over winter, it does well in deep pots on a sunny kitchen windowsill. Notes: If you make 2 sowings, one in the spring and one in mid summer, you'll be able to harvest all through the season for cooking. You can also make a drink from the leaves. Click for a parsley tea recipe. To return to the main how to grow herbs page, click here.